In early May do you get frantic, looking for good Mothers Day gifts to make, or to buy, and of course, the Mother's Day card? A lot of people rush to ask online, "when is Mother's Day this year?" Both the USA and Canada celebrate it on the same date. Some other countries have assigned another date, or even call it 'Mothering Sunday.' A simple rule to remember is that in North America it always falls on the second Sunday of May. This brings me to my first suggestion to help you celebrate Mothers Day in a way that will thrill your Mom best. Simply Plan Ahead. Your mother likely had nine months to prepare for your birth (or less if you were born prematurely), so surely, you could start planning ahead, say, starting right after Easter - to plan how you will express your love and appreciation to your mother on her special day. Ideally we should be showing our mothers love every day, but as we grow up and get busy with our own adult lives, we begin to understand the value of setting aside one particular day as Mother's Day each year. Our mothers hear and see the fuss that the commercial world makes over their suggested Mothers Day gifts and treats, so they feel hurt and disappointed it you make no real effort. (Let's acknowledge that there are some mothers so disfunctional, perhaps even cruel, that about all you can thank them for is that they allowed you to be born. This annual date is a great sadness to the sons and daughters of such 'mothers.' My heart goes out to you, and perhaps I can make helpful suggestions on another page). The first step in your planning then, is a Thinking Time, to determine what your mother really means to you, what kind of response you want to give her, and what would be the best way to show your love and gratitude. Think over what kind of woman your Mom is; her personality and interests. What delights her most? Jot down these thoughts as they will be a great guide for you in deciding what to do for Mothers Day gifts and cards. For example, when you were a toddler or Kindergarten-student, you probably brought Mommy some dandilions, and your little hand-crayoned pictures or cards and crafts, and she ooh-ed and sighed with pleasure over them. But as you've grown older you've observed that Mom doens't naturally care for crudely made crafts and cards. She only fussed over them because it was you that made them. She wanted to praise and encourage you for your little altruistic efforts. If that's the case, you need to study what does make her excited and happy as a person, and try to get a gift related to that passion. Too many times our gifts reflect what we like and admire, rather than what the recipient is tickled to pieces over. This is why I say, take time well in advance to think these things through. Once you have an objective profile or perception of your Mom's personality and her likes and dislikes, it will be much easier to zero in on the best gift ideas. Some of these ideas will take some time to prepare. The more personal effort and thought you put into your Mothers Day gift and card, the more she will appreciate them, and know that you are now loving her back as an understanding adult. That will mean a lot to her! The new mommy may be delirious over the romance of motherhood; she'd be pleased with chocolates, flowers, and a pretty card. Even gooey wet kisses. Or, if she's exhausted, she might much prefer some personal spa time, and coupons for free babysitting as her ideal Mothers Day gifts. Now if your mother is the mature, Grand Dame type, perhaps even a senior in a nursing home, she is still your mother and loves you - whether her mind drifts at times, or not. She might be most thrilled with framed photos of you and your family. Or, if you are able to scan some old favourites of hers from way back, and present them attractively in a way she can see and enjoy on a daily basis, that will be a big hit with her. Most of all, spend some quality time with your mother! Wish you could be a Power Shopper in a hurry? How to use them? Sign up for my free email course that explains things in greater detail. Do you see how planning ahead and giving yourself time to think theses ideas through will improve how you give Mothers Day gifts to your Mom? My mother was gored by a cow before I started school. This meant she was sickly and in and out of hospitals most of the years I can remember. As the oldest child I was forced into a grown-up role as I had to often cook, do the laundry and supervise my younger siblings. Once I finished high school and had worked long enough to pay off a car, I went east to the big cities of Ontario, determined to finally have a life of my own. I sent her Mother's Day cards and small gifts but thought I was doing all that was required of me. When my youngest sibling left home, Mom began to phone and say that the doctor said she should not be doing housework, but she was not going to hire a maid as long as she had a single daughter. I wrestled with this decision for two years and went home for my vacations over two summers to size it up. Finally I decided that I needed to give her the gift of my time and caregiving, not just because she asked such a huge request, but I saw that I needed to prove to myself and to her, that I had forgiven her for the neglect I'd felt while growing up. I knew it had been unintentional on her part, but my spirit felt wounded anyway. 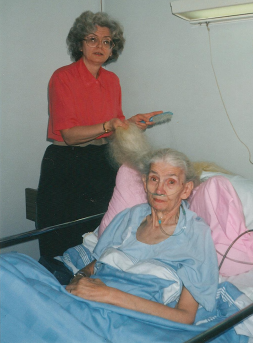 I saved Mom's life several times over the next 14 years before Mom died of kidney failure and congestive heart failure. (Yes, I have a book in me about those caregiving years and what I learned, but I'm not ready to write it yet). I learned a lot of lessons about forgiving and loving a difficult mother, and what kind of gifts and activities worked and what did not work with her. She was not good at sharing her true feelings, so I had to develop skills at reading other clues. Do you see now why I say it is so important to study and know your own mother, and find out what makes her tick? She is unique, and not like any other mother. Learning to have the right attitude of respect and kindness will go a long way to making you a better person too. You won't be able to make your mother over, but you can work on yourself! Try it.